a tan stripe over the eyes. Their throats are whitish with very rufous hindnecks, back of the neck. The back and rump are rufous-brown with some pale edgings and the belly is pale buff or tan. Their flanks, sides, are tawny, copper color. The primary feathers are dull brownish with light rufous wingbands. Their tails are somewhat rufous in color and their lower legs and toes are grayish, brownish, or blackish. 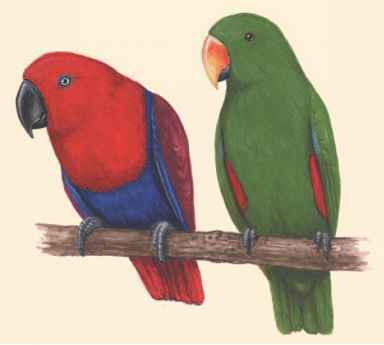 Males and females are similar in color. Juveniles are paler on the undersides. Adults are 6.3 to 9.1 inches (16 to 23 centimeters) long and weigh between 1.1 and 2.3 ounces (31 and 65 grams). 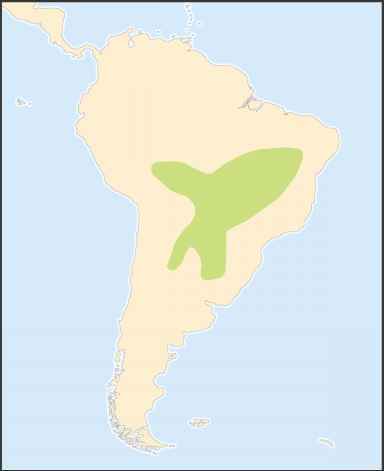 Geographic range: They are widely found in Bolivia, much of southern Brazil, Paraguay, Uruguay, and northern and central Argentina. Habitat: Rufous horneros usually inhabit scrublands, pastures, agricultural lands, urban parks, and gardens. They are often found near streams, rivers, ponds, or lakes; usually in lowlands but they can be found to about 8,200 feet (2,500 meters), and occasionally up to 12,150 feet (3,500 meters). Diet: Their diet consists of insects, other small invertebrates, and seeds. The bird forages on the bare ground and among leaf litter, often probing into soft dirt with its bill. 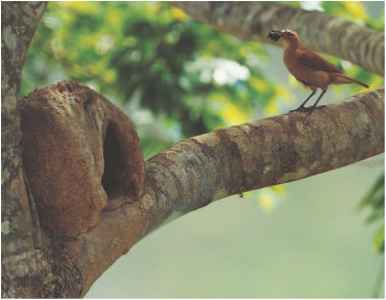 Behavior and reproduction: Rufous horneros do not migrate. They are usually found alone or in pairs on the ground where they run and hop, and perch in open spaces within shrubs. Their song is a loud, fast, rhythmic series of notes such as "kweep!" and their calls include a sharp "jeet!," "jeah," or "krip," often sounded as a series of notes. Pairs of birds often sing back and forth with each other. The breeding season of the monogamous (muh-NAH-guh-mus), having only one mate, birds is in the spring-summer, September to February. Rufous horneros will defend their breeding territory, where they construct a large nest made up of thousands of small clumps of moist mud, clay, some dung, and straw carried to a nest site with their bills. The inside of the nest is lined with bits of grasses and stems. The spherical, oven-shaped structure is usually placed on a tree stump, fencepost, telephone pole, or rooftop; but can also be placed on older nests, bare ground, or rock. The entrance is usually placed on the side of the nest. Two to five eggs are laid from September to December. The incubation period is fourteen to eighteen days. Both males and females incubate eggs and take care of the nestlings. The nestling period is twenty-three to twenty-six days. Rufous horneros and people: The rufous hornero is the national bird of Argentina. They are often found near human dwellings.